Holy Spirit Double Shot POWER! I'm excited because I get to wear my red stole at the traditional worship service at my church. There's some rule somewhere that states I should only wear a red stole on Pentecost or when an elder or another pastor is getting ordained. Some of you might be asking, "Yeah, and what the heck is a stole?" This... is my red stole. And my smoking hot wife. She's pregnant now so she looks a little different, but she's still smoking hot. Yes, I am married to one smoking hot pregnant woman. And my stole looks pretty flippin' sweet, too. I just made a decision. I don't care what dried up old prune of a person made up the rule that I can only wear my red stole on certain Sundays of the month. They had to be a Presbyterian, because Presbyterians don't really talk about the HOLY SPIRIT OF GOD on any other days of the year. Unless they are praying one of their long elaborate, eloquently written prayers where they try to talk about the Spirit in vague mystical and somewhat feminine terms. My man Francis Chan writes about this in his excellent book, "The Forgotten God," which I reviewed right here on this blog. You can purchase said book by clicking on the link to the right. It's like 7 bucks. This Sunday I decided that I would preach from one of the Lectionary texts for Pentecost, so picked Genesis 11:1-9, which tells the story of the Tower of Babel. When I was a kid, I was always fascinated by that story. I would imagine a bunch of dudes building a big tower, like a clock tower with bricks and the stuff that they put in between bricks to make them stick together. I had a picture of the Tower of Babel in one of my children's Bibles and it looked a lot like the turret on a medieval castle. There was a guy in the foreground trying to understand the guy next to him who was apparently speaking in a language that the other guy couldn't understand. In the background there were similar scenes of consternation. The Tower of Babel story is pretty simple: Ancient people decide to build a tower that will reach to heaven, God comes down to see what's what and decides that they've gotten too big for their britches and so he confuses their languages (there had been just one language up to this point, according to the text) and they can't understand each other. So, they scatter all over the place and the Tower of Babel becomes a symbol of man's pride and God's power. I love the fact that the Tower of Babel story is read from the Lectionary on the same day as the story of Pentecost from the book of Acts. 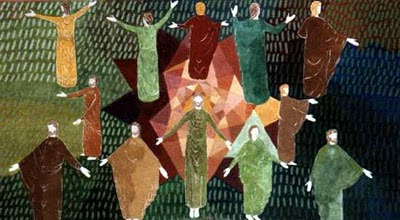 In the Acts story, the disciples of Jesus are all together in one place when the Holy Spirit falls upon them "like flaming tongues of fire." They all head out to the temple and begin speaking in different languages--the same languages that the pilgrims who have come to Jerusalem to worship speak. Everyone hears the Gospel of Jesus Christ in his or her own language. And then Peter preaches the sermon of his life and 3,000 people join "the church." Acts is like Babel being reversed. In Acts there is no man-made tower... just a Spirit-filled group of people, the "living stones" that Peter later wrote about. In Acts there is no confusion with languages, just clarity when God allows people to hear the message in their own language. In Acts there is no pride and fear---there is humility and courage. I was thinking about the game Jenga this week. Mainly because it's sort of like a tower. But also because the object of the game is to take pieces of the tower away, trying not to let it fall down. If you remove the wrong sequence of blocks, then you've got lapful of Jenga. What if this wasn't a game? What if the tower of Jenga was actually your career, or your financial future, or some other tower that you've built in hopes that it would stand forever? 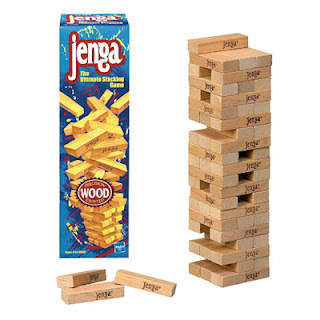 What if the object of Jenga was to remove blocks every time there was crisis, or an obstacle in life... or a moment of fear... or a broken relationship... or a financial meltdown? How long would yours last? The tower in the Tower of Babel was probably a ziggurat. A ziggurat was a pyramid of sorts--during the 3rd and 4th Millenia they littered Mesopotamia. Ziggurats were all structure and no substance. There was no inside to the ziggurat. It was built to be impressive on the outside. The top of the ziggurat was considered to be the gate of the gods. Each one had a bed at it's top where food was left for the gods. You see, the towers were not meant for people to ascend to heaven, but so that the deity could descend to earth. The ziggurat at Sippar had a name that translates: "temple of the stairway to pure heaven." My mind reels with Zeppelin references. The text of the Tower of Babel story reveals an unbelievably self-centered group of people who want to "build ourselves a city," and "make ourselves famous." They are fearful that their nomadic lifestyle will result in a loss of their identity. They are fearful that if they don't do something their safety and security will be forfeit. They wanted immortality. With the advent of bricks that could be baked hard and solid they had the technology to do just that. Rabbinic legend relates that people paid no mind of a worker fell to his death, but if a brick fell and was destroyed they lamented the delay to their work. As I read that I thought of the recent oil spill disaster in the Gulf of Mexico. Everyone is focused on the oil spill itself. No one ever talks about the 11 people who died when the oil rig exploded. People tried to create their own idyllic world without God, and it came crashing down. Acts 2 reverses Genesis 11. Through the power of the Holy Spirit, what once was the result of human-centered pride and folly becomes the very thing the Spirit uses to spread the Good News of Jesus Christ. We are called to do the same. When we embrace a life constructed through the power of the Spirit of God, we move from an Us-centered life to a God-centered one. We move from "certainty" (or what we consider to be certain) to the risk that gives us a life full of God-directed adventure. We also move from pride and fear to humility and courage.